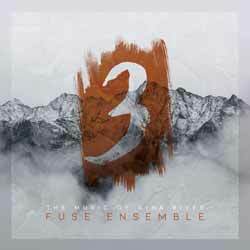 3 is a mellow, enjoyable album from Gina Biver. Each of the five pieces (44 min, 20 sec) is inspired by either a book, poem, quotes or painting. It's not overly important to know what the inspiration was to enjoy the music, but the linear notes help to get a look inside Biver's thought process. The opening track, 'Mirror', draws its inspiration from the poem Empress in the Mirror by the American poet Colette Inez – who joins the composer in contributing spoken word to the track – Biver begins her exploration into the very nature of identity. 'Girl, Walking' continues that exploration, flowing through five sections that are shaped as they go along by improvisations of the parts of the bassist, flutist and guitarist. 'We Meet Ourselves' is dedicated to fellow Fuse Ensemble member Scott Deal, whose solo marimba triggers audio samples which represent Jung’s theories about the impact of confrontations with the unconscious and of the messages we receive as we go through life. 'The Cellar Door' explores Jung’s theory of individuation, the process by which the psyche becomes integrated and whole. The album closes with 'No Matter Where', in which Biver interprets No Matter Where, Not Pictured Here, a painting by the American artist Jackie Tileston, as a journey. An engaging and novel album that is diverse and multi-layered.